This DIY (do it yourself) kit will allow you to put your bells on a black 15-bell fully lined, buckled strap. The strap is 1 1/2 inches wide and about 56 inches long from the buckle at one end to the tip of the billet at the other. 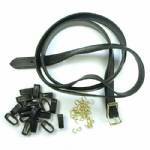 When buckled, this strap will make a loop from 47 to 52 inches around.